Willie Ratner's Wagner first appeared in a newspaper in 1930 and later in "The Complete Book of Baseball Cards" in 1976 (above). It was in the November 6, 1930, edition of the Newark Evening News that the legend was born. 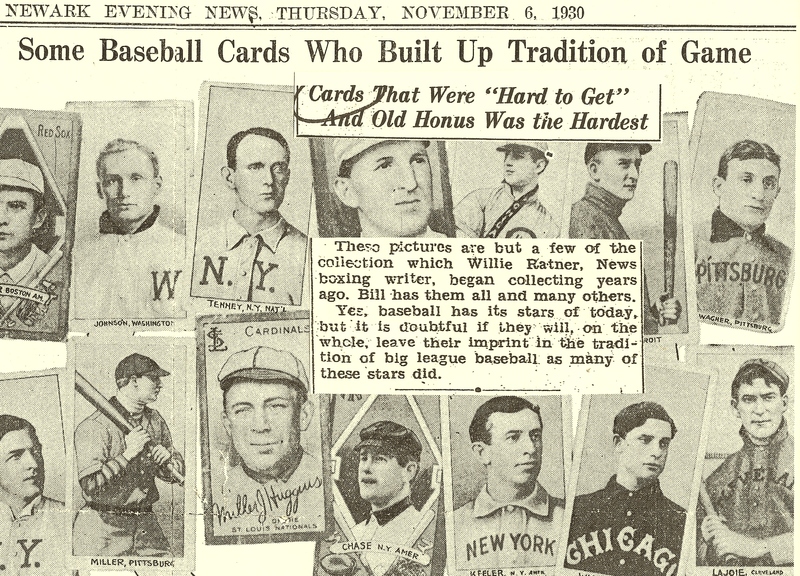 Writer Fred J. Bendel published an article about the baseball card collection of fellow News scribe Willie Ratner, a nationally renowned boxing writer who started working at the newspaper as a copy boy in 1912. Ratner was about 15 years old when the famous T206 tobacco card issue was commercially distributed in cigarette packs. The Wagner card was actually first mentioned decades earlier in the Charlotte-Observer in August of 1909, just as the cards were showing up in packs of Piedmont Cigarettes in the South. 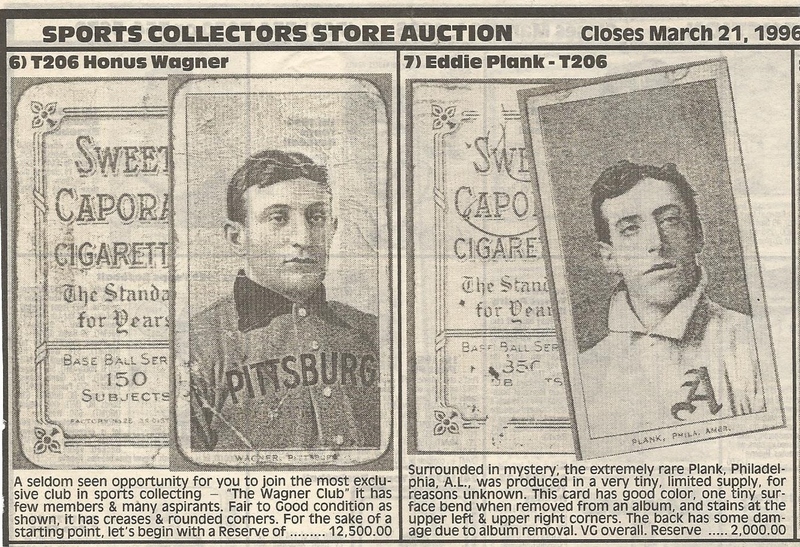 The article claimed that the cards were “more sought after than gold” by young boys who purchased packs of cigarettes for the pictures of “baseball men” and then “peddled the smokeables to passers on the streets.” The report noted that the cards of Ty Cobb and Honus Wagner were especially desired but that “only a few pictures of Cobb had been found” until a shipment arrived at the Wilson Drug Store and 13 more Cobb’s surfaced. No mention was made of a Wagner card being discovered. Sportswriters Wirt Gammon (left) and Willie Ratner (right) both collected T206 cards when they were issued commercially in tobacco products. By the time Ratner had sold his Honus Wagner to Gammon, the Tennesean was selling T206 cards in the "Ballcard Collector" for just 45 cents. An article published in the Charlotte Observer in August of 1909 described the popularity of T206 cards and the affinity kids had for them. The article describes early "card-flipping" which likely contributed to the condition of Willie Ratner's Wagner (center). In addition to covering boxing matches in his “Punching the Bag” column, Ratner not only collected the pictures of baseball players on cards, he also commiserated with real-life sports legends and stars of the silver screen like Jack Dempsey and the child actor Jackie Coogan, who he met on a cruise to Paris in 1924. Ratner even rubbed elbows with underworld crime figures and in 1929 was notably assaulted by racketeers for his “sarcastic reporting” of several “fast ones” pulled on boxing fans in Newark, which was known as a “sucker town” on the fight circuit. Luckily for Ratner, the gangsters didn’t take his Honus Wagner as a hostage. Willie Ratner's Honus Wagner first appeared in the Nov. 6, 1930, edition of the Newark Evening News (NBL). Wirt Gammon had wanted a Wagner ever since he was a little kid. In his “Gammon’s Corner” column in 1970 he fondly recalled how he collected T206 cards soon after they were released in cigarette packs sold by the American Tobacco Company. Gammon wrote, “When T205 and T206 began around 1910, I was five years old and I can remember back when I was about seven that these cards began to appear everywhere. Many smokers collected them. If not, their children collected the bright colored pictures, often begging parents to buy a pack.” Gammon recalled how he only had one relative who was a smoker and that, much to his dismay, his uncle smoked a brand that didn’t include baseball cards. Gammon also recalled that many smokers simply discarded the cards after opening their pack and he wrote, “It was nothing to walk along the street and see a baseball cigarette card on the sidewalk or the edge of the road or edge of a yard.” So that’s how he collected them. He added, “The best I could hope for was to find a card or two along the sidewalk, where some smoke-stained-fingered guy had discarded it as he opened his pack.” Gammon, however, never found a Wagner in the gutter and had to wait several decades until Willie Ratner was willing to part with his prized possession. Wirt Gammon placed want-ads for Wagners as early as 1953 in The Sporting News (inset from "Bob Lemke's Blog"). Gammon sold his Wagner to Bill Haber in 1970 and Haber showed off the card in a 1971 issue of The Trader Speaks. Gammon had been searching for years for his own Wagner via want ads he placed in The Sporting News and other publications with no luck until he finally acquired his “Holy Grail” from Ratner. Little did Gammon realize that like his fellow scribe he was merely a temporary caretaker of the T206 treasure and he ended up parting with the rarity when a young Brooklynite named Bill Haber offered him $500 for the card on June 1, 1970. Haber was working as the baseball director for the Topps Chewing Gum Company and was responsible for the player bios and facts found on the backs of baseball card issues. He was also one of the sixteen founding members of the Society For American Baseball Research in 1971 and according to the current SABR website he was, “considered one of the greatest biographical researchers” in baseball research history. But Haber’s other passion was baseball cards and he was a dedicated collector who by 1970 had assembled near-complete sets of the T205, T206 and T207 issues. According to Haber it took him 19 months to assemble the sets and in his “Haber Hi-Lites” column in The Ballcard Collector, he said his “greatest stroke of luck occurred when (he) found a non-collector who had a (Eddie) Plank, and (he) bought it from him for $6.” That left Haber with only the Honus Wagner on his wish list and he then proceeded to “make a cash offer to all (he) knew had the card.” Haber recalled, “The going price when I was looking was $250. I decided it was worth $500 to me.” Wirt Gammon accepted Haber’s cash offer and after the collector “borrowed $350 from (his) wife” Gammon shipped the Wagner card up north to Brooklyn where it remained in Haber’s collection for several decades until the mid-1990’s. 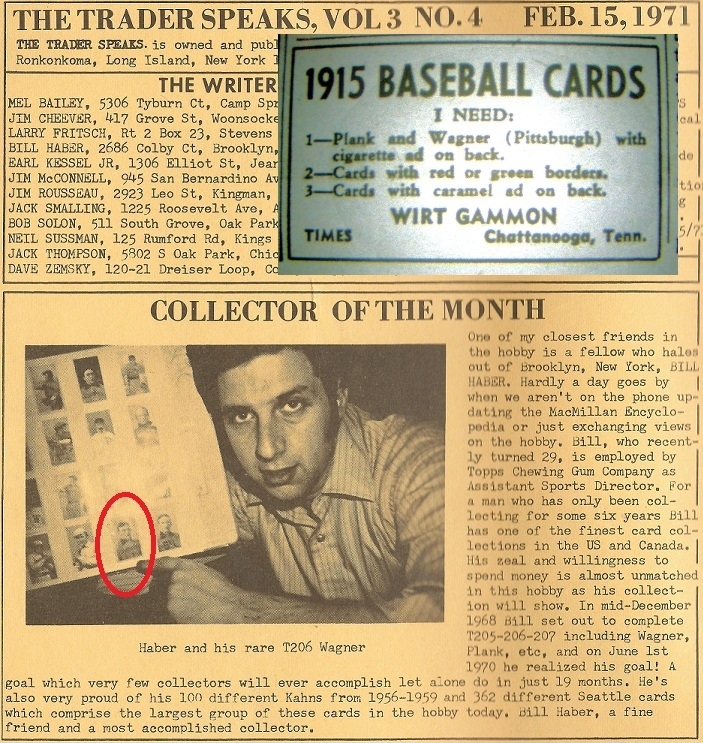 When Haber was profiled in the “Collector of the Month” feature in The Trader Speaks in February of 1971, he was pictured holding his Wagner which was still affixed to a scrap book page with other T206 cards arranged alphabetically. Based upon that image it is possible that Ratner or Gammon had maintained their original collection in a scrapbook and that a full page, including the Wagner, was passed along to Haber. By the time Haber acquired the card in 1970 it was still affixed to that page which had been removed from a larger volume. Gammon had told Haber the card was “creased and stained” but the card’s condition was an afterthought. Haber only knew of “6 or 8″ collectors who had one at that time. In June of 1973, Haber told Dan Dischley in The Trader Speaks that his Wagner was scheduled to be featured on a TV show “dealing strictly with collecting” and hosted by Joe Garagiola before his “Monday-Game-of-the-week” telecast. (Its unclear if that show ever aired.) Haber’s Wagner was also reproduced by Woody Gelman’s company, the Nostalgia Press, in 1975 to create one of the earliest Wagner reprint cards. The card has always been easily identifiable on account of its unique creases and imperfections. After Bill Haber's death in 1995, his Wagner appeared for sale in an SCD auction conducted by Pat Quinn and Bill Mastro of The Sports Collectors Store in Chicago. Haber did business with most all of the prominent collectors in the 1970s and 80s including other Wagner owners like Bill Mastro and Mike Aronstein. In fact, it was a 17 year-old Mastro who attended with Haber what was considered one of the earliest card “conventions” held in Aronstein’s basement in Upstate New York in 1970. Traveling from all over the country, collectors like Mastro and Haber joined Dennis Graye, Dan Dischley, Tom Collier, Bill Zekus, Bob Jasperson, Irv Lerner, Bill Himmelman, Fred McKie and other notables in a makeshift “convention hall” located in Aronstein’s downstairs den. 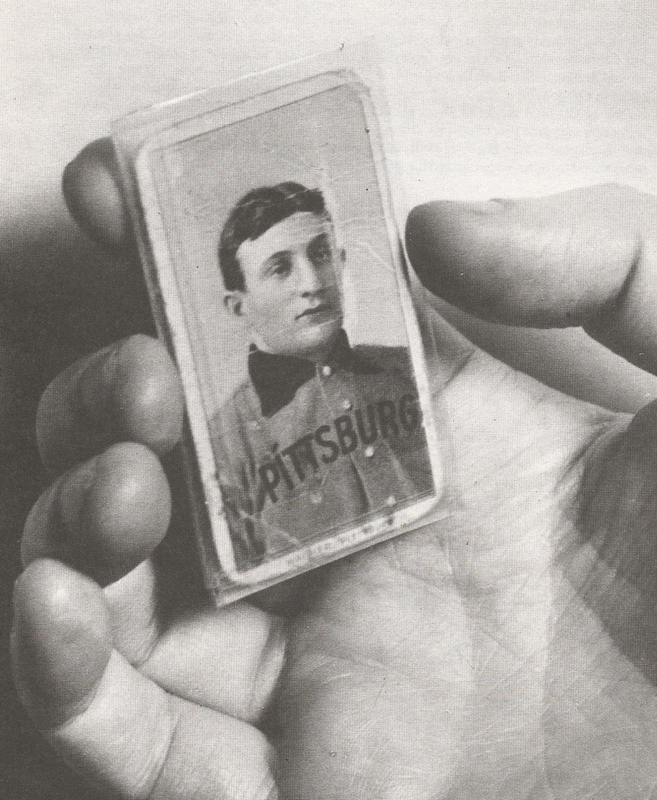 Haber brought along his Honus Wagner card to show off and after impressing the group tried to “get the trading wheels going.” As the room filled up, Mastro, Jasperson and Graye were described as the only attendees “under voting age” and, according to the Ballcard Collector, Haber traded Tom Collier for some 1949 Bowman PCL cards and Mastro was able to trade with Graye for a T206 Sherry Magie error card. There’s no doubt that when Mastro saw Haber’s own Wagner he wanted one for himself. Bill Haber (center) purchased his Wagner from Wirt Gammon for $500 in 1970 and by 1973 a young Bill Mastro had paid a record-breaking $1,500 for another Wagner. Bill Mastro, on the other hand, went on to become the country’s preeminent card dealer with an uncanny knack for tracking down multiple Wagner cards in high-grade condition and turning hefty profits. By 1981 Mastro said he had already seen twenty Wagner cards in person during his collecting career and by 1985 he’d purchased two more Wagner cards for $25,000 each. One of those cards was the now infamous Gretzky-McNall Wagner which Mastro recently admitted he’d altered and trimmed before he sold it to Jim Copeland for $110,000 in 1987. 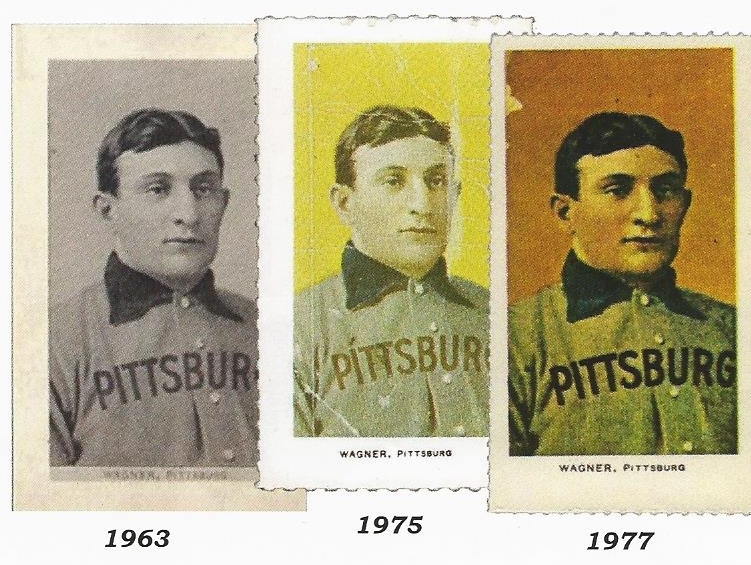 While Mastro was keeping tabs on all of the Wagners in the hobby and contributing to their skyrocketing value, Bill Haber was content to sit on his own Wagner and his completed set of T206 with no intention of selling. Quinn isn’t sure who ended up joining the ever so exclusive “Wagner Club” after his auction in 1996. ”I can’t remember who bought that Wagner in the SCD sale, it was such a long time ago and it was one of my last auctions,” said Quinn. It’s also unknown whether Willie Ratner’s Wagner has changed hands again since the time of Quinn’s auction or whether its been graded by either PSA or SGC. SGC President, Dave Forman recalled seeing the card in 1996 and told us, “I remember the auction but have no idea where it is now.” One things for sure, however. Whoever the current owner is, he possesses the “Original Wagner” and an important piece of baseball and hobby history. It represents the true essence of collecting more than a near-mint condition Wagner ever could. There are other Wagners more valuable and pleasing to the eye, but this Wagner transcends its own imperfections. It’s the original. Great article Peter!! I love the picture of Quinn, he hasn’t changed a bit! Nice work. Worth keeping on the hard drive. Super article! Looking forward to all the rest. Where did you get that picture of Ratner? That’s a tough photo to get! Great read. Loved every bit of it and looking forward to more. at his house once a month and being the youngest at 13 years old,watching everyone buying and trading Cards out of their cigar boxes. that’s where i bought my first T206 Cards,($1.50) and Old Judges. 1951 Topps Current All-Stars were the most elusive items to acquire back in 1973. too bad the Auction crooks and self proclaimed expects that showed up in the 90’s , have ruined a beautiful hobby. Ratner also served as a bat boy for the Newark Peps of the Federal League in 1915. I wrote Topps around 1959 to see if I could buy old cards to complete my sets and Woody Gelman sent me his Card Collectors Co. brochure, but more importantly, forwarded my name to a handful of prominent collectors including Buck Barker, Lionel Carter, Charles Bray and Wirt Gammon. Since I lived in Metro Atlanta and Wirt was close to Chattanooga, we visited each other, became friends and he would send me a few vintage cards every week that I would buy for my collection. He showed me his Wagner on my first visit and indicated he would have sold me the card for a few hundred dollars…however being a teenager who was recently married, I couldn’t afford it at the time, to my everlasting regret. But I will always have the memory of holding that famous card. FYIW, Buck Barker needs some major props for his contribution to the Baseball Card Catalog and his unbelievable kindness and generosity: I would send him samples of any new cards I found or bought for him to catalog and he would reward me with a packed envelope of nice cards for my collection. And I could send him any quantity of cards in my collection that I could not identify and he would send the cards back with the name of the set and other info, plus he would give me more cards from the same sets. He was a wonderful cheerful kind man who added many cards to my collection and never asked for anything in return except to be notified of new or unknown issues.